Fans of the old TV show "Saved by the Bell" are getting a chance to step back in time and feel like part of their favorite '90s high school sitcom gang. But chances are they are eating better than the kids at Bayside High ever did. 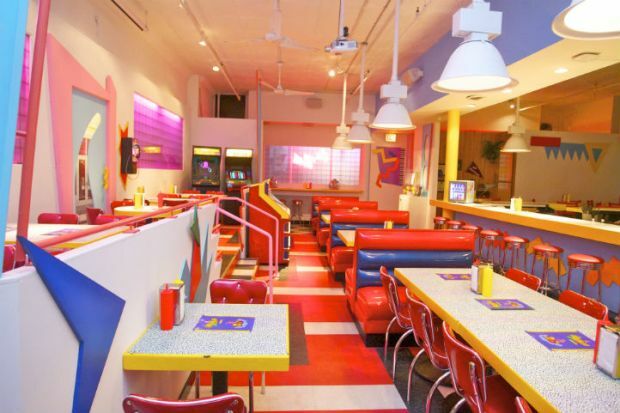 In a plan that class schemer Zack Morris would find genius, a vacant restaurant space in Chicago's Wicker Park neighborhood has become Saved by the Max, a replica of The Max. The fictitious Southern California hangout was where students would hash things out over fries and milkshakes. "It's so cool," said Mallory Carl, of Chicago, who was eating at a counter seat on the restaurant's opening day Wednesday. "The whole atmosphere is just like it, especially that pink Max sign. That was the big iconic image for any time they shifted to a scene here." Actor and magician Ed Alonzo, who played diner owner Max, also got in on the fun. After liking the project on Facebook, he was invited to appear during opening week at the pop-up diner. Dressed like his TV alter-ego, he surprised fans with magic tricks, just like on the series. "Unfortunately, I don't think there'll ever be like a 'Saved by the Bell' television special reunion . I think this is as close as I'll get to it," Alonzo said. "This is better than the original Max that we used to shoot the show on over at NBC." The eatery will be open nightly through Aug. 31 for ticketed dinners. It also offers walk-in brunch and late night service. Tickets for the dinners have already sold out. The overwhelming interest hasn't escaped cast and crew from the show. Producer and writer Peter Engel will appear at the diner this summer. Invites have gone out to the actors including "Extra" TV host Mario Lopez, who played jock A.C. Slater and has talked about the diner on his iHeartRadio show, according to Berry. With a recent wave of '80s and '90s shows such as "Full House" getting revived, Berry said he knows the interest is completely nostalgia-driven. He also gives some credit to "Tonight Show" host Jimmy Fallon. The late-night comedian's "Saved by the Bell" skit last year with original cast members has more than 33 million hits on YouTube. The restaurant has gotten inquiries from fans as young as 21 to 40-somethings who grew up on it. "Someone emailed me from Australia as an inquiry, asking if they could get married here," Berry said. The restaurant is looking at possibly staying open beyond summer. "I think there's demand to stay open. How long? I'm not sure. You never want to milk something dry," Berry said. "I don't want to do this until we only have three people sitting at the diner bar."